If you're planning a trip to Boston you will struggle to decide what to do. There’s an endless selection of things to see and attractions to enjoy. Head to Boston Common at any time of year, it’s a big beautiful park in the middle of the city. 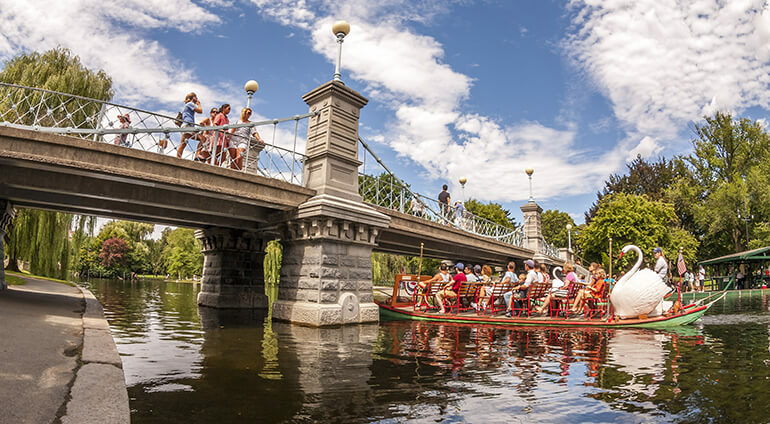 Boston Public Gardens is another great place to unwind in the city, make sure you have a go on the swan boats. If you want to see American culture at its finest then book tickets to any pro American sports game in the city and see teams such as the Boston Red Sox, the New England Patriots and The Celtics. Comedy fans should spend an evening at the Improv Asylum, Boston’s best comedy club in the north end. The Museum of Fine Arts is another must see attraction. Boston Harbour is a really cool place to go; it’s a natural harbour adjacent to the city. The Boston Public Library is an impressive building that’s definitely worth a visit. Most tourists also make an effort to see the world famous Harvard University, which is about a 15 minute drive out of the city. To see many of the city’s wonderful sights, stroll along the Freedom Trail, a 2.5 mile long path which runs through downtown Boston.